Goalie Jared Coreau went 12-18-1 in 32 regular-season games with the Rampage. ST. LOUIS – Not that they’ll need him, but the St. Louis Blues have another goaltender available for the postseason following the recall of Jared Coreau from San Antonio of the AHL. Coreau will serve as the third goaltender on the Blues’ playoff roster behind starter Jordan Binnington and backup Jake Allen. The Blues acquired Coreau, 27, from the Anaheim Ducks on Jan. 3 in exchange for future consideration. He arrived with some NHL experience, having gone 5-9-4 in 21 games with the Detroit Red Wings from 2016-18. 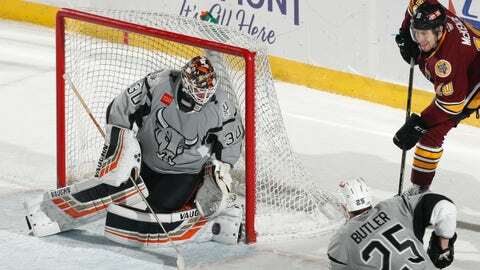 The 6-foot-5, 214-pounder played in 32 regular-season games with the Rampage this season, going 12-18-1 record with a 3.15 goals-against average and .886 save percentage.